We are a team of highly educated and experienced researchers, the majority of us has or is working towards a doctorate degree in theoretical and applied aspects of information security. We are part of the active scientific community by publishing peer-reviewed papers at top security conferences and in journals. Many of us have received prestigious awards and are internationally recognized for their scientific achievements. 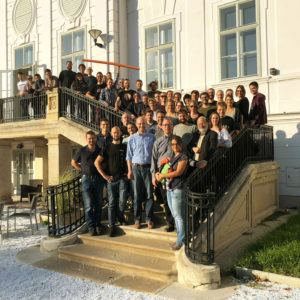 As part of our academic career, many of us regularly teach classes on the technical and organizational aspects of information security at our Austrian partner universities and Universities of Applied Sciences. While training the next generation of experts in important aspects of information security, we also pay special attention to disseminating research results and making students aware of the latest developments in information security. Apart from our academic education, we attach great importance to ongoing training and certification. Our security analysts who focus on professional services hold CISSP (Certified Information Security System Professional), CISA (Certified Information Systems Auditor), CPTS (Certified Penetration Testing Specialist), CISM (Certified Information Security Manager), CSSLP (Certified Secure Software Lifecycle Professional), CRSIC (Certified in Risk and Information Systems Control), CEH (Certified Ethical Hacker), CPT (Certified Penetration Tester) as well as Microsoft (MCSE, MCITP) and Novell certifications.